Attracting perky little wrens to your backyard is as simple as providing an inviting environment filled with brush piles, tangles and lots of low branches for cover, protection and a source of tasty bugs. Win their hearts with your homemade fence post wren houses and you'll be rewarded by friendly encounters and cheerful songs resounding throughout the spring and summer. Zipping around, perpetually in motion, these wee brown birds will love their fashionable fence post homes and because of a dwindling number of nesting sites available for cavity-nesting birds, you’ll be aiding their survival. Cut 10-inch lengths of the fence post with a hacksaw or miter saw. Drill 1/2 inch ventilation holes about 1 inch from the top on the front and one of the sides of the fence post. Drill a 1 1/8-inch entrance hole 4 inches from the open bottom of the fence post. Sand all around the edges of all the holes with the sandpaper, inside and out, until they are completely smooth with no sharp edges that could harm the birds. Cut the wood floor bottom for the house. Sand the edges of the wood floor until smooth. Pre-drill one hole on each side of the wood. Set the wood into the open bottom of the fence post until the bottom is flush. Mark a drill point on the fence post on both sides, then drill the holes. Screw the wood floor bottom into place with the two pan head screws, which easily can be removed when you wish to clean the house. Drill a 1/4-inch hole in top of the fence post cap. Thread the nut and washer through the hole, then hold the bottom nut with a needle nose pliers while twisting the eye hook tight on the top. Apply glue around the perimeter of the inside of the cap and around the perimeter of the top of the fence post, then affix the cap onto the fence post. Let dry for 24 hours, or according to the instructions on the glue. 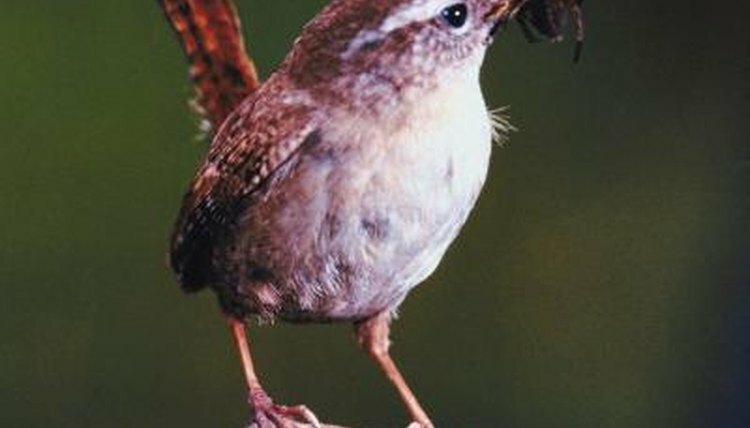 Hang the wren houses from tree limbs or porches about 6 to 15 feet high.  In early spring, offer a selection of feathers, hair, dryer lint and other soft materials for nesting, by placing the materials in a tray or directly on the ground near their houses.  When you cut or prune trees or brush, consider heaping the cuttings into a pile near their houses as a safe place for all the wrens to gather. The wrens will pick up grass and small twigs for their nest.  It's a good idea to build several wren houses, rather than just one or two. House wrens lay two broods of six to seven white eggs each in the nesting season between April and July, incubating the eggs for 12 to 15 days. Males build several nests to impress their mates and the fussy females choose the one they like best.  Your wren houses also will attract other small, appealing birds, such as chickadees, titmice, nuthatches and tree swallows.  Lots of different materials can be used for wren houses, from recycled tins or gourds to ceramic and wood.  Perches on a wren bird house look cute, but they also allow predators easier access to eggs and nestlings.  Check with fence building contractors for recycled vinyl or wood fence posts and caps, which are an eco-friendly and budget-friendly alternative to using new materials for your wren houses. ⚠ Space nest boxes well apart; wrens are known to sometimes destroy the eggs and nestlings of nearby birds.